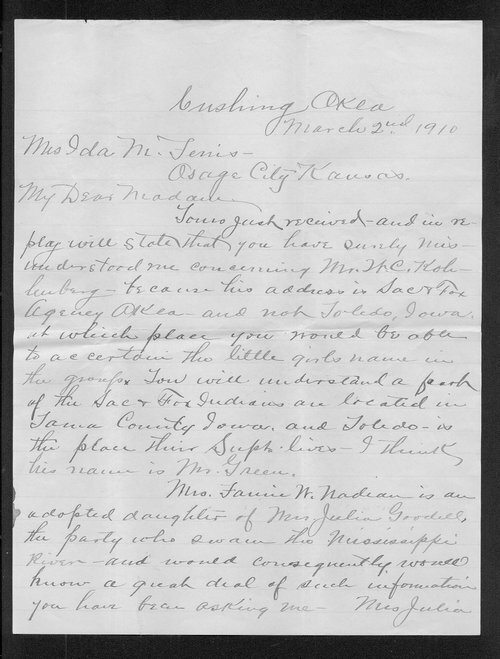 In this letter to Ida M. Ferris, Sac and Fox member Walter Battice addresses Ferris's quest to gather information on the Sac and Fox tribe. In fact, Battice explains that Mrs. Keokuk, the wife of Chief Keokuk, was alive and well at 84 years old. Battice also explains that his "tribe is composed of two tribes - The Foxes and the Sacs - and in bygone days we used to have a Fox Chief & a Sac Chief - at the time you speak of [mid-1800s] - Keokuk was our Sac Chief."